Located in the ground floor of the emblematic Imperial Palace Hotel, the most recent Cristal Spa is proud of its sanctuary of 600m² of immaculate and ultra-modern decoration inspired by the contrasts in the surrounding nature. Architect Pierre Brunier has imagined an inspiring waterfall tumbling into a fully glass swimming pool with a Jacuzzi. 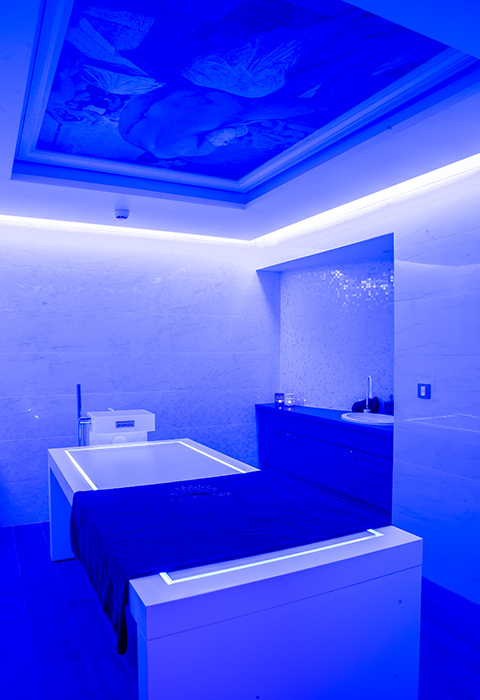 Sink into the Karim Rashid armchairs or experience the extraordinary sensory shower where you walk through changing temperatures, jet intensities, colours and even floor textures.You may prefer the dry atmosphere of the sauna or the benefits of the hammam with its ceiling lighting that evokes DNA molecules. 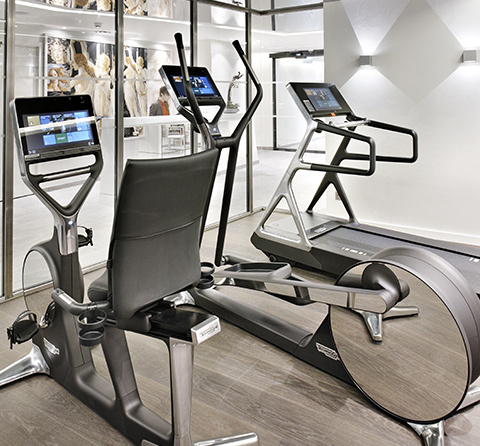 Sports lovers will love the fully outward facing Cardio Training Gym equipped with the latest in Technogym equipment. From 8am to 10pm for hotel residents. For the comfort of your clients, access to the pool for resident children up to 12 years old is allowed from 4 pm to 6 pm. A haven of serenity awaits you with 6 treatment rooms and a luxuriant relaxation suite with herbal teas. Each room carries the name of a semi-precious stone and the ceilings are covered with reproductions of bathing scenes by famous painters. The theme continues to reception with a superb triptych of Boticelli’s 3 Graces. 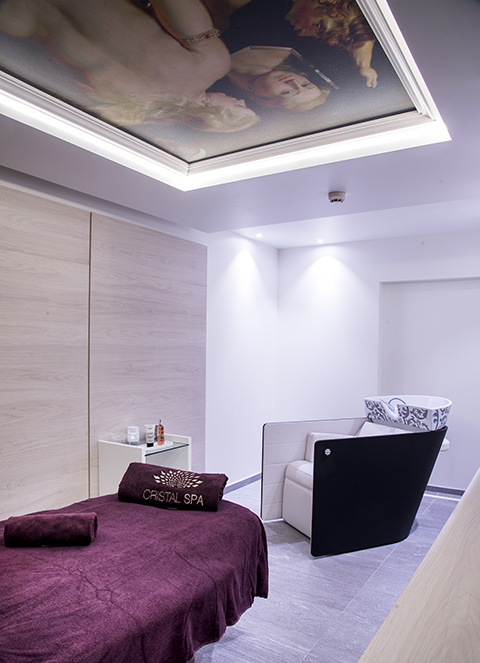 The Cristal room evokes purity with its warming table and chromatherapy bathed in a hammam atmosphere for a massage or body ritual. The ceiling is decorated with a reproduction of a detail of Ingrès painting, Le Bain turc. The Ambre room offers a massage area with a hair treatment sink by Dutch designer Marcel Wanders. Total relaxation is assured. The ceiling is decorated with a reproduction of Toilette des Vénus of the dutch artist Rubens. The Amethyste room offers a chance for couples or friends to share their special moment with 2 massage tables. The ceiling is decorated with a reproduction of a detail of Ingrès Le Bain turc. The Agate, Jade and Quartz Rose rooms linking with contrasts of materials and colours. The ceilings are respectively decorated with reproductions of Michelangelo, Sibylle libyens, detail of Chapelle Sixtine and Tête de femme as well as artist Jean-Auguste Ingres, le Bain turc.